Huge 8m high steel mesh panels have been created for the University of Nottingham by sports fencing manufacturer Zaun Limited. The special lacrosse variant of Zaun’s popular Duo8 Sports fencing has been installed at Nottingham’s Jubilee Campus by Dawn Fencing Limited. Leigh-based Dawn Fencing has been going more than 30 years and is the only fencing contractor dedicated solely to sports. The central 30m behind each goal end of the lacrosse field included three different panel specifications to suit play. The bottom 3m comprised special lacrosse panels with dense 50x33mm mesh of 6mm vertical wires at 50mm centres and dual 8mm horizontal wires at 33mm centres. From 3m to 6m in height, Dawn installed Zaun Super Rebound panels with 50x67mm centres, which are highly durable, low maintenance, ‘graffiti-proof’ and offer great rebound properties similar to a wall. And the top 2m used a 50x200mm mesh pattern purely for added ball retention and safety of passers-by using nearby university buildings. 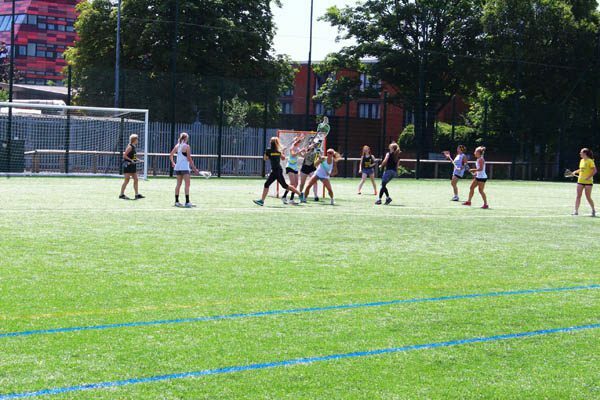 The university fields six teams across men’s and ladies in British Universities & Colleges Sport competitions with matches most weeks, and development teams entered in beginners’ tournaments. A mixed team also competes in a regional league and enjoys a tour to Liverpool.